"If you are really thankful, what do you do? You share." In this month of November, many classrooms in the U.S. teach about the Pilgrims and Thanksgiving. It's an iconic image: English people in black or brown clothes wearing black peaked hats and shoes with buckles, and Indians dressed in deerskin clothing and beaded moccasins, eating turkey, pumpkin and squash and smiling. We know now that it wasn't that simple, that the story of Thanksgiving is much more complex. Certainly, the arrival of the English Separatists, later known as Pilgrims, on the coast of Massachusetts in 1620 was a turning point. There is no doubt that they faced hardship and that local Indians helped them survive. Without the help provided by the Wampanoags, the English settlers might not have made it through the winter and then the history of this country would have been very different. 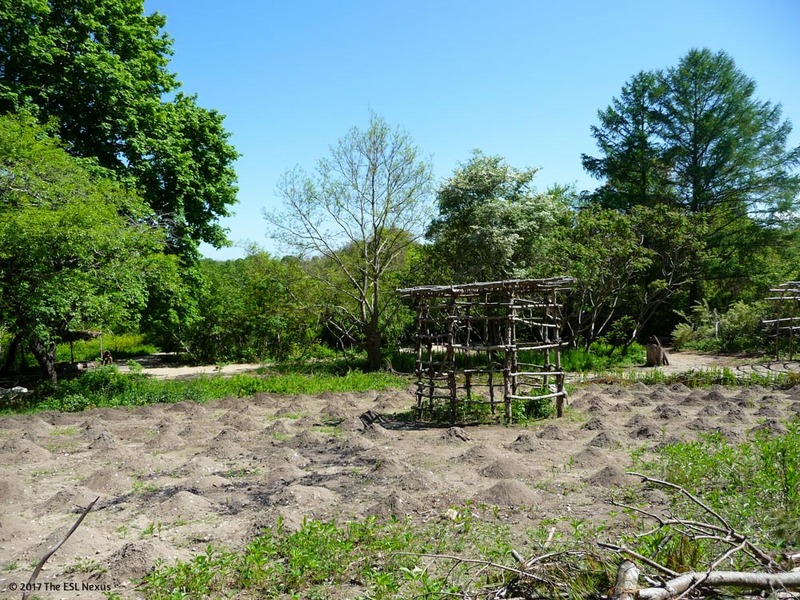 In May 2014, I visited Plimoth Plantation and the Wampanoag Homesite nearby. It was fascinating! I spent an entire day there soaking up the atmosphere and learning about the history of both peoples through talking with reenactors playing the roles of actual Pilgrims and with members of the Wampanoag tribe who share their culture with visitors by describing what Native life at the homesite was like. 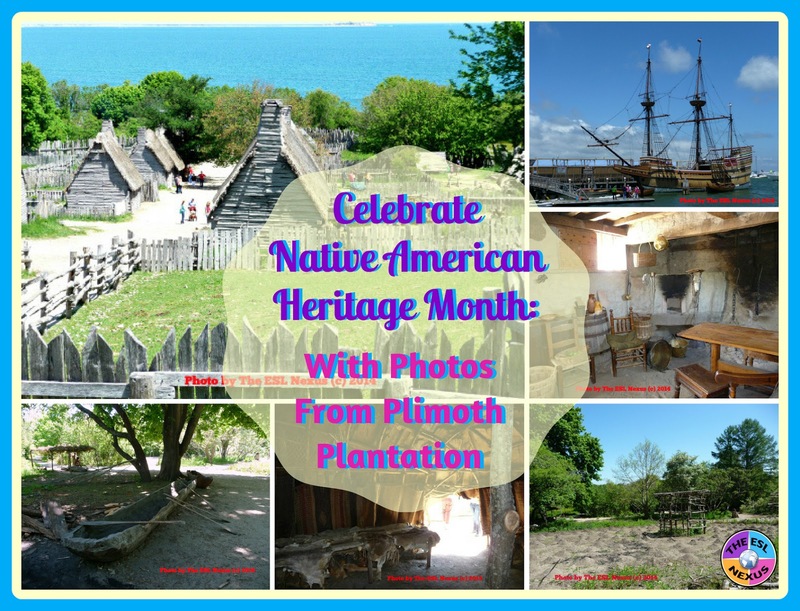 I took over 300 photos and created a slideshow for my students in 5th grade who learned about Early European colonies, including Plymouth, addressing part of the Massachusetts History and Social Science standards ("5.6: Explain the early relationship of the English settlers to the indigenous peoples, or Indians, in North America, including the differing views on ownership or use of land and the conflicts between them..."). I'd like to share the following photos, which show what a huge contrast there was in the cultures of the two peoples. 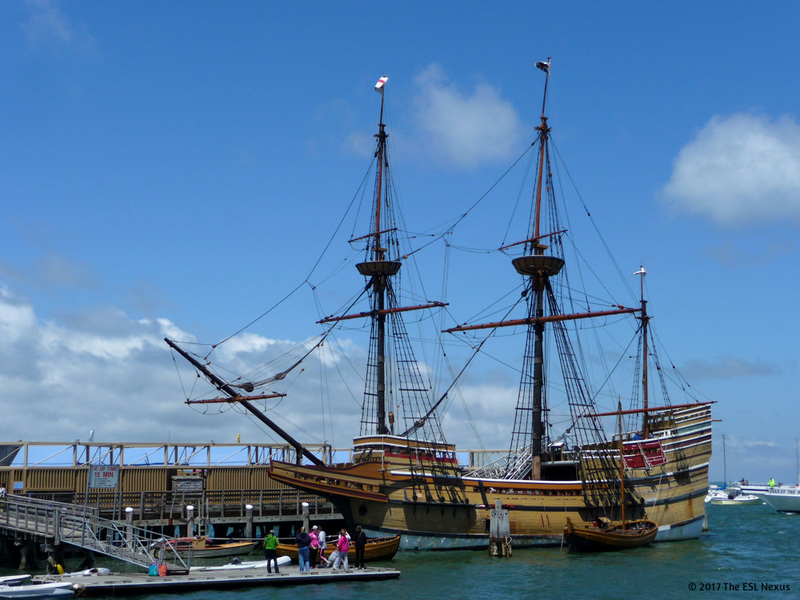 The English arrived in the New World on the Mayflower; shown below is the Mayflower II, a reconstruction of the original ship that is docked in Plymouth Harbor. 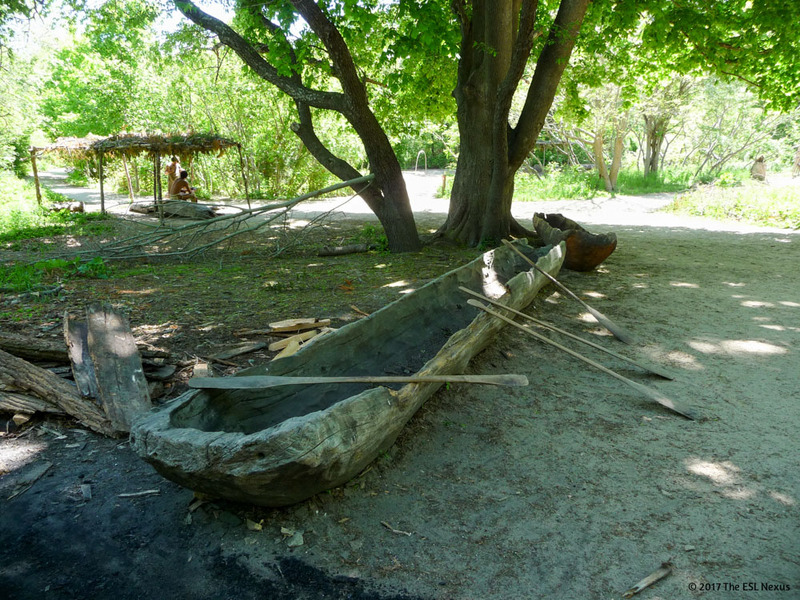 Below is a photo of a Wampanoag mishoon, the Native Americans' typical means of transportation on water. There is quite a difference in technology here! 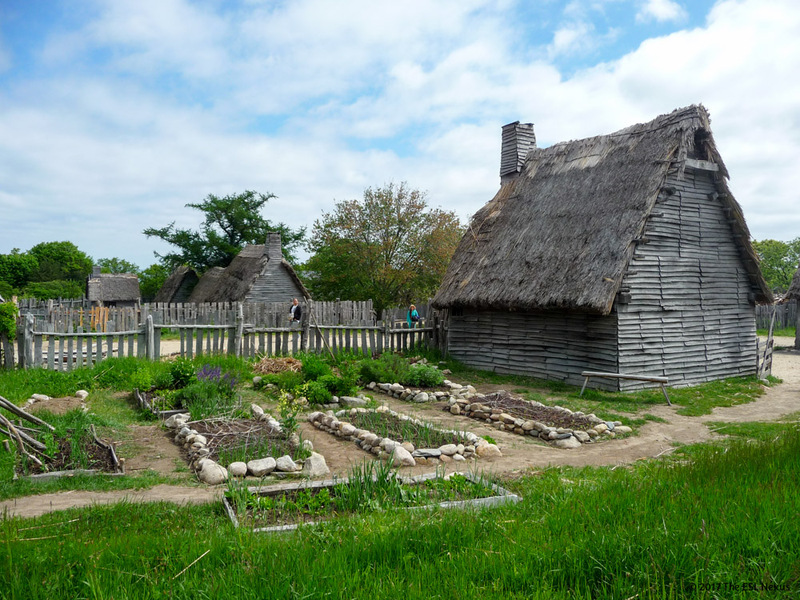 The picture below shows a kitchen garden at the English Settlement at Plimoth Plantation which, by the way, is not located at the actual historical site but a few miles away. A Wampanoag cornfield is shown in the picture below. Note how the English have fenced in their land in the photo it above but the Wampanoags have not. Another contrast is in housing. 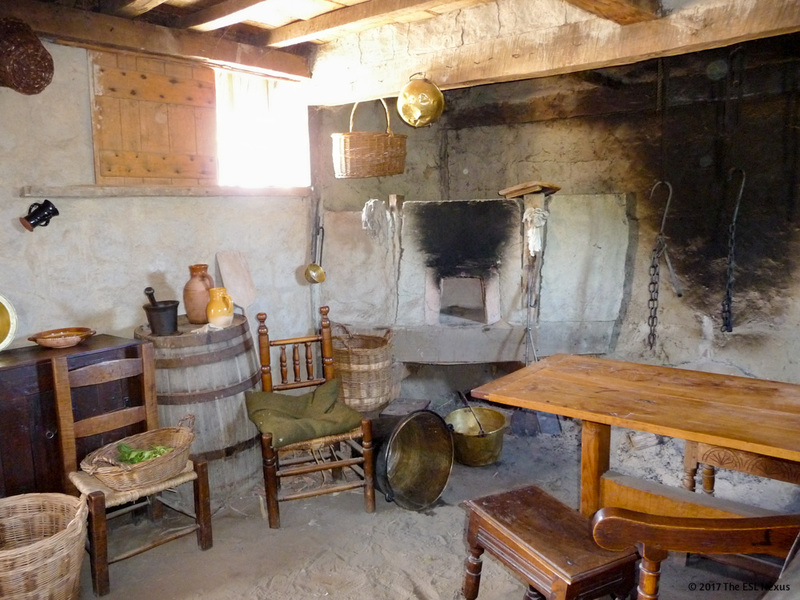 Look at all the furniture and metal possessions the English had in the photo below. 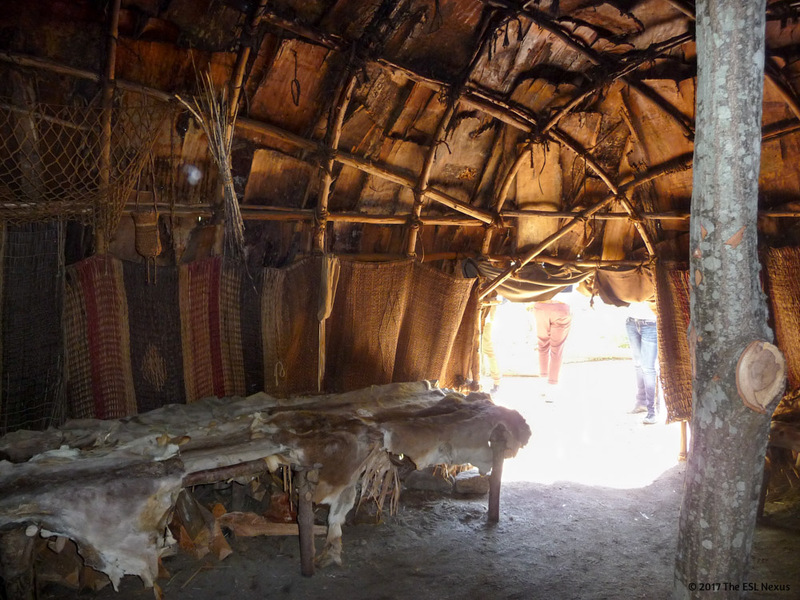 Although this photo below of a Wampanoag wetu doesn't show it, they also had many household items; however, they were not made of metal and their furniture consisted of wooden benches. The photos in my slideshow were a great starting point for discussing the impact of the European settlers on Native societies. I wish I'd had more time to go deeper! But I read an article entitled 'All Indians Are Dead?' At Least That's What Most Schools Teach Children and it was an eye-opener. The core assertion was that most schools do not teach about contemporary Native American society and by not doing so, schools are doing a disservice to all students. It would certainly behoove all of us to provide a more well-rounded picture of Native Americans and, indeed, all ethnic groups in the United States. It shouldn't be all that difficult or time-consuming to make connections between the story of Thanksgiving and modern issues affecting Native Americans. November is a great month to start.